Stephen Curry is a two-time MVP. He has a pair of NBA championships to his name. He was the headliner on the best regular-season team in Association history. He is considered the greatest player of all time. Is he now prepared to add “NFL minority stake holder” to his resume? Rapper and mogul Sean “Diddy” Combs and Golden State Warriors All-Star Stephen Curry are among a strong, diverse group that e-commerce billionaire Michael Rubin is putting together as potential minority owners in his effort to purchase the Carolina Panthers, a source told ESPN.com on Tuesday. Rubin’s name surfaced on Sunday as a serious bidder to purchase the team that Jerry Richardson put up for sale amidst an NFL investigation into allegations of workplace misconduct. As Newton notes, the race to buy the Panthers, who were most recently valued at $2.3 billion by Forbes, includes at least two other serious parties. But you can sign me up for this one. The NFL is chock full of uptight owners who care far too much about the optics and the appearance of political indifference. Any group that solicits Curry’s (and Diddy’s) involvement is dancing to the beat of a different, more outspoken drum. 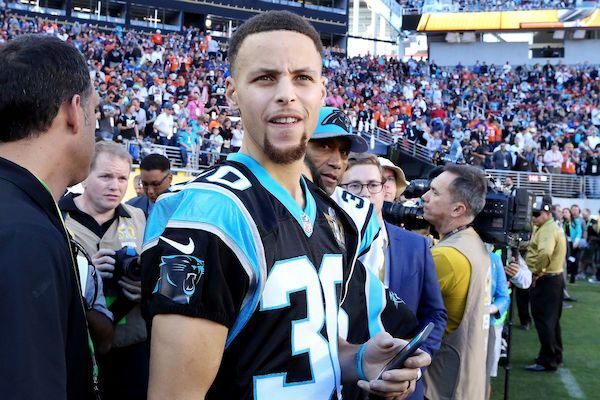 Seriously: Imagine Curry, as a minority stakeholder in an NFL team, continuing to speak out on social injustices. He isn’t on LeBron James’ or Steve Kerr’s levels when it comes to profound candidness, but he would still throw the league for a whirl. So, yeah, here’s hoping this happens—or at least to seeing how the NFL plays this in the event it’s about to happen.